Colorado is what the gun training industry calls a shall issue state. 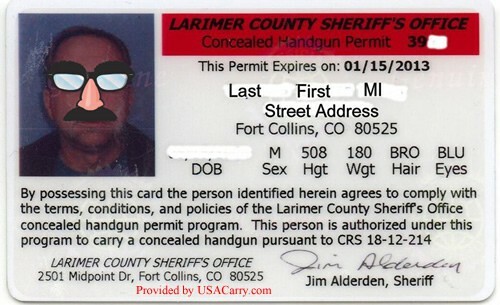 In this shall issue state, the state of Colorado does not issue the concealed carry permit. The permits are issued by each county sheriff and the rules are the same everywhere in the state. The Concealed Carry Permit has to be issued to any individual that qualifies by the guidelines in the statute. The Concealed Carry Permit process in Pueblo,Colorado is very simple and is listed below. · A $52.50 processing fee in the form of a cashier’s check or money order, made payable to the Colorado Bureau of Investigation (CBI). This fee pays for a state and national criminal history check (fingerprints) and for an Insta-check (NICS) per Statute. This is required for all regular civilian applicants. · A $100.00 processing fee in the form of a cashier’s check, money order, or personal check, made payable to the Pueblo County Sheriff’s Office. This fee pays for forms, ID cards, local criminal history checks, and other administrative costs. · A copy of documentary evidence demonstrating competence with a handgun as specified in section 18-12-203 (1) (h) of the Colorado Revised Statute. · Is a legal resident of the State of Colorado. A person, who is a member of the Armed Forces and is stationed pursuant to permanent duty station orders at a military installation in this state, and a member of the person’s immediate family living in Colorado, shall be deemed to be a legal resident of the State of Colorado. · Is twenty-one years of age or older or is at least 18 years of age if seeking a temporary,emergency permit. · Is not ineligible to possess a firearm pursuant to section 18-12-108. · Has not been convicted of perjury under section 18-8-503, in relation to information provided or deliberately omitted on a permit application. · Does not chronically and habitually use alcoholic beverages to the extent that the applicant’s normal faculties are impaired. · Is not an unlawful user of or addicted to a controlled substance as defined in section 18-18-102(5). Whether an applicant is an unlawful user of or addicted to a controlled substance shall be determined as provided in federal law and regulations. 1. a restraining order issued pursuant to section 18-1-1001 or section 19-2-707, C.R.S. effect at the time the application is submitted. 1. evidence of experience with a firearm through participation in organized shooting competitions or current military service. 2. evidence that, at the time the application is submitted, the applicant is a certified instructor. 4. proof of honorable discharge from a branch of the United States Armed Forces that reflects pistol qualifications obtained within the ten years preceding submittal of the application. 5. a training certificate from a “handgun training class” (see definitions) obtained within the ten years preceding submittal of the application. The applicant shall submit the original training certificate or a photocopy thereof that includes the original signature of the class instructor. In obtaining a training certificate from a handgun training class, the applicant shall have discretion in selecting which handgun training class to complete. Concealed Carry Training in Pueblo Colorado is available from our list of instructors. Our Pueblo Concealed Carry Class can be scheduled at time that suit your busy life.